Resource allocation in patient care relies heavily on individual judgements of healthcare professionals. Such professionals perform coordinating functions by managing the timing and execution of a multitude of care processes for multiple patients. Based on advances in simulation, new technologies that could be used for establishing realistic representations have been developed. These simulations can be used to facilitate understanding of various situations, coordination training and education in logistics, decision-making processes, and design aspects of the healthcare system. However, no study in the literature has synthesized the types of simulations models available for non-technical skills training and coordination of care. A systematic literature review, following the PRISMA guidelines, was performed to identify simulation models that could be used for training individuals in operative logistical coordination that occurs on a daily basis. This article reviewed papers of simulation in healthcare logistics presented in the Web of Science Core Collections, ACM digital library, and JSTOR databases. We conducted a screening process to gather relevant papers as the knowledge foundation of our literature study. The screening process involved a query-based identification of papers and an assessment of relevance and quality. Two hundred ninety-four papers met the inclusion criteria. The review showed that different types of simulation models can be used for constructing scenarios for addressing different types of problems, primarily for training and education sessions. The papers identified were classified according to their utilized paradigm and focus areas. (1) Discrete-event simulation in single-category and single-unit scenarios formed the most dominant approach to developing healthcare simulations and dominated all other categories by a large margin. (2) As we approached a systems perspective (cross-departmental and cross-institutional), discrete-event simulation became less popular and is complemented by system dynamics or hybrid modeling. (3) Agent-based simulations and participatory simulations have increased in absolute terms, but the share of these modeling techniques among all simulations in this field remains low. An extensive study analyzing the literature on simulation in healthcare logistics indicates a growth in the number of examples demonstrating how simulation can be used in healthcare settings. Results show that the majority of studies create situations in which non-technical skills of managers, coordinators, and decision makers can be trained. However, more system-level and complex system-based approaches are limited and use methods other than discrete-event simulation. Quality and safety in healthcare depend on the successful interaction between multiple teams, individuals, and support processes aimed at making the right resources, such as medications, medical equipment, information, and people, available at the right time [1, 2]. Furthermore, in many healthcare settings, resource utilization must be prioritized such that the person most in need of a resource from a medical perspective will receive it. The cost of failure is high, both in terms of personal tragedies as well as the socio-economic burden of increased costs due to prolonged treatments or hospital stay . Many of the everyday decisions regarding how resources will be used for patient care are made by individuals and networks of people performing coordinating functions, in the sense that they manage the timing and execution of many care processes of multiple patients. Their decisions often depend on judgements combining perspectives on the relevant medical conditions, the resources at hand, and the urgency of the situation; their decisions also depend on receiving information to help make sense of the situation as well as managing high stakes and competing goals . Little is known about how these prioritizing and coordination skills are learned, how people performing them build their mental system models, what information and strategies they use, and which work practices are most successful. Most of the individuals performing coordination tasks are trained on the job in an unsystematic manner, and the knowledge remains, for the most part, tacit. Simulation in healthcare is well known as a method for training individuals and teams in escalating situations surrounding individual patients . To create meaningful simulations for training the non-technical skills used in coordination , there is a need to develop simulations of logistical challenges in a systematic manner as well as to describe and develop learning outcomes for the non-technical skills used in coordination. To support this development, it is important to know what types of logistical problems can be addressed by what types of simulations. Logistics is one of many growing fields in healthcare management. This trend is driven by various societal impacts; population growth and an aging society have already put pressure on the operation of healthcare systems [7, 8]. While healthcare logistics has been defined in various ways by researchers, in this paper, we define it as “operational handlings for the delivery of care, including its supportive services, from origination to recipient.” Focusing on the recipient of services, healthcare logistics could be patient-centric or material-centric. Patient-centric logistics relate to patient flows through the healthcare system. In this context, quality, safety, and efficiency of services for patients are keywords. Material-centric logistics address the positioning, storage, and circulation of goods and materials, such as blood and pharmaceutical products, within the hospital or the healthcare system. Computer-based simulation plays an important role in the operational support of healthcare logistics. Generally, simulation can be useful in the design of complex social-technical systems . As an innovative technology for adding analytical capacity, simulation can be used as an intermediate test in the (re)design of organizational rules and structures, workflow process management, performance, and avoidance of human errors [10, 11]. More specifically, according to Jun et al. , simulation could provide benefits such as more effective redesign or innovation, deeper insights into barriers and incentives to adoption, and provision of an environment to “bench-test” final products prior to formal release. A change or improvement in real systems, however, might be expensive or dangerous, and balancing resource allocations is a central non-technical skill for healthcare professionals. Simulation adds value by providing a solution for training individuals to solve customized problems in a virtual, persuasive environment. The application of discrete-event simulation in healthcare began to grow considerably at the end of the 1990s ; however, it remains unknown what type of simulations could be used to train, develop, and test non-technical aspects of coordination. Many types of simulation paradigms exist today. Discrete-event simulation, system dynamics, and agent-based simulation are the most utilized tools for modeling and analyzing systems according to the user’s interests and the specific task addressed. Discrete-event simulation is a tool for assessing the efficiency of delivery structures, forecasting changes in patient flow and examining resource efficiency in staffing . System dynamics focus on the effect of structure on behavior . Instead of addressing individual transactions, system dynamics is commonly used for higher level problems, such as strategic decision making, management controls, or policy changes . Agent-based simulation is based on a “bottom-up” construction for the provision of emergent phenomena based on individual interactions of resource units . Literature reviews have been conducted with explicit focus on the application of simulation in patient flow or material flow. 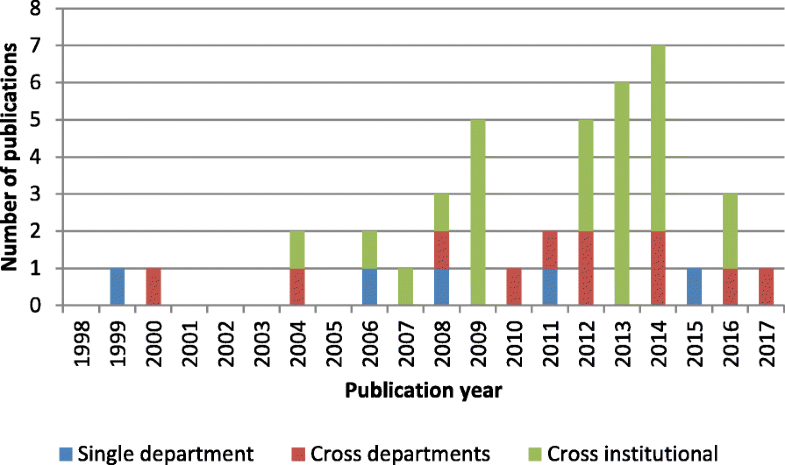 However, previous literature reviews have been limited in at least one of the following aspects: (1) Reviews usually address simulation of healthcare logistics in a very narrow manner, analyzing a single key aspect such as low stakeholder engagement , a single simulation technique , or a single department; (2) most reviews have examined papers published before 2012. What types of simulation models are currently available for training non-technical skills in handling logistical issues? To answer the research question, the Web of Science Core Collection, the ACM Digital Library, and JSTOR were searched to retrieve articles focusing on simulation in healthcare logistics between 1998 and 2017. We utilized papers from these three databases because all of them rigorously select core journals and the keynote proceedings of conferences. The search terms were divided into the following two categories: patient-centric queries and material-centric queries. The papers were screened following the Preferred Reporting Items for Systematic Reviews and Meta-Analysis (PRISMA) guidelines. The keywords were formulated by the individual reviewers to identify papers on relevant simulation techniques and investigated systems, as summarized in Table 1. Keywords such as “healthcare,” “patient flow,” “pharma*,” “blood,” and “drug” specify the issues addressed. Keywords such as “simulation,” “system dynamics,” “simulator,” and “game” specify the research methods implemented. Application-oriented paper. The paper employs at least one simulation technique and presents a detailed scenario, or experiment, of a real-world healthcare system. Subjective and methodological paper. The paper focuses on subjective and methodological perspectives on simulation techniques but might not report a use case (Fig. 1). The scope of the research and focus area were decided after the screening process. Simulation paradigms were classified based on statements from the authors; if no simulation technique was stated, the conceptualization framework was checked to determine its relevant category. Following the retrieval of papers, discarding of duplicates, and review by the authors, the total number of essential publications was 294. The search identified 248 patient-centric and 46 material-centric papers. The patient-centric spectrum included 214 problem-solving papers, among which 114 utilized discrete-event simulation. For material-centric papers, discrete-event simulation was the dominant simulation paradigm as well. The number of publications for the past 5 years remained high, reinforcing our supposition that there is much knowledge to be gained from recent publications. The repository is available in the declaration. For qualitative analysis, representative papers, listed in Table 2, were identified. The papers featured statements of the relevant research questions or a description of the investigated system. We considered the number of publications utilizing different simulation techniques, scopes of research, and tools. These studies focus on modeling patient pathways from admission to discharge as acting the basis of direct intervention on patient flows. These studies use simulation for decision support of care capacities. Simulation is used to identify impact factors in service procedures. These studies address handling of patients in the regional healthcare network. These studies use simulations to analyze hospital infrastructure and its impact on the operation. These studies use simulations to support the modeling and analysis of improvements in the system perspective. The simulation model is generally used for recreating different actors in the supply chain network. These studies explore different inventory or replacement polities for material handling. These studies use simulations for operational transport. These studies focus on the design of the network. Simulation is used for understanding the interactive rule between service vendor and recipient. Reviews, surveys, and methodological reflections and comparisons of logistics simulations in other sectors. Following the screening process, we identified the question levels and the categories of addressed issues. The following question levels were derived: single department/unit, cross-department/unit, and cross-institutional. The category single department/unit included studies that model operation within a single department in an organization. The category cross-department/unit included studies that simulate multiple departments/units within the same organization. The category cross-institutional included the simulation modeling of interactions and flows between healthcare service providers in a large-scale network with widespread distribution regions. We identified the following categories of addressed issues: care pathway and appointment, staffing decision making, work procedures, specialized transport, facility design, healthcare systems, supply chain, inventory management, network distribution and dispatching, network configuration, procurement logistics, methodological contributions, and miscellaneous. The facility design was considered because architectural planning is a strategic decision that has a durable and profound effect on healthcare operation. The miscellaneous category included all research publications that we were not able to clearly classify into at least one of the abovementioned categories. Discrete-event simulation has been applied to model and analyze all aspects of logistics management in healthcare. In particular, patient flow management and planning of staffing requirement are effective applications of this simulation technology. Our profiling of the literature is mostly in line with the findings of previous literature reviews; that is, discrete-event simulation is a useful tool with respect to improving patient flow, managing bed capacity, and scheduling and utilizing of resources [16, 17]. DeRienzo et al. addressed the effect of nursing capacity by comparing different nursing sizes and demonstrated the applicability of supporting healthcare managers in handling operative tasks . Devapriya et al. also developed a decision-supporting tool based on discrete-event simulation for the strategic planning of hospital bed capacity . Bhattacharjee et al. analyzed appointment scheduling policies for patients to be treated by a medical scanning machine . Vasilakis et al. developed a discrete-event simulation to study how long it took for patients to obtain their appointments from their referral . Jørgensen et al. investigated internal blood logistics in hospitals and evaluated the effects of various management controls on the waiting times for accessing blood samples . This simulation paradigm is most suitable for the realistic representation of processes in health services for analyzing “what-if” scenarios and assessing the performance of a logistical system. System dynamics is used for organizational simulations. The paradigm is a mechanism-driven one for making decisions strategically for health services and resources from a global perspective. For instance, Rashwan et al. developed a system dynamics simulation to study bed blocking in Irish hospitals . The focus was twofold: testing the policies for solving delayed discharges and envisaging the counterproductive and unintended consequences of these new policies . Brailsford et al. simulated patient flow perspectives to identify system-wide bottlenecks . Through the simulation, Lane et al. showed that the daily variation of used hospital bed capacity could not be balanced in the long run by simply increasing capacity; instead, optimal design of flows should be the core of the operation technology . One paper investigated logistical outsourcing  and deployed system dynamics simulation with a sensitivity analysis for the evaluation and analysis of sustainability and economic performance. Content holders can use system dynamics simulation to envisage the complexity and identify opportunities and risks of the policies and management controls proposed. Agent-based simulation could be considered a means of soft computing in healthcare logistics. Agent-based simulation provides a gateway for understanding the behavior of distributed and connected service providers. The associated modeling and analysis are able to handle engineering system problems in complex networks. As an example, this paradigm was introduced to solve the coordination and collaboration difficulty of caregivers in a mental healthcare system . The positive effect of coordination technology was confirmed by such modeling considerations. The local decision rules of caregivers were relevant for operative decision making with respect to successful provision of home help, a conclusion drawn from Marcon et al.’s work . Bidding decisions made by distributers and suppliers in the pharmaceutical industry were studied in Jetly et al.’s work . The performance of a multi-site network was simulated with pre-selected indicators, including the number of released products, degree of consolidation, and the return on assets. Multi-agent systems are not only effective for modeling flows between providers; they could also be applied in hospital environments. In Marin et al.’s work, patients, nurses, doctors, and the department as the manager are specified as agents with simple behavior rules . With the support of multi-agent languages, the properties and relationships of actors could be simulated and validated for a specific social-technical environment. Games and participatory simulation are life-like media that facilitate experimental learning. The use of such media enables the development of non-technical teamwork skills. For instance, Mustafee and Katsaliaki developed a pedagogical business game that simulated the blood supply chain [32, 33]. The players were encouraged to propose different solutions, taking costs, time-efficiency, and stock levels of products into account. Focusing on quality of service in healthcare, a web-based organizational simulation was built and deployed for training referral and diagnostic skills . The results showed that the usefulness of information on symptoms, diseases, and severity levels is associated with the perception of information sources. A board game provided valuable insight into the adoption of future technology in hospital logistical work . Regarding the practical settings of two hospitals, the adoption of wearable technologies was reflected through role play. Such role playing could also be used to analyze the working environment in wards . Hybrid modeling is the efficient combination of various simulation modeling techniques described. Most hybrid modeling involves coupling discrete-event simulation and system dynamics. Two case studies, concerning infection control and regional social care system engineering, were simulated using hybrid models . Zulkepli modeled an integrated ICU by combining system dynamics and discrete-event simulation . The greatest advantage of hybrid modeling is the ability to integrate different simulation approaches and empirical data from different sources . Discrete-event simulation has been the most prominent paradigm for modeling patient-centric logistics over the past decade. Between 2008 and 2017, as presented in Fig. 2, more than half of the included papers used discrete-event simulation. However, the distribution of simulation techniques among different periods showed growing methodological diversity in recent years. 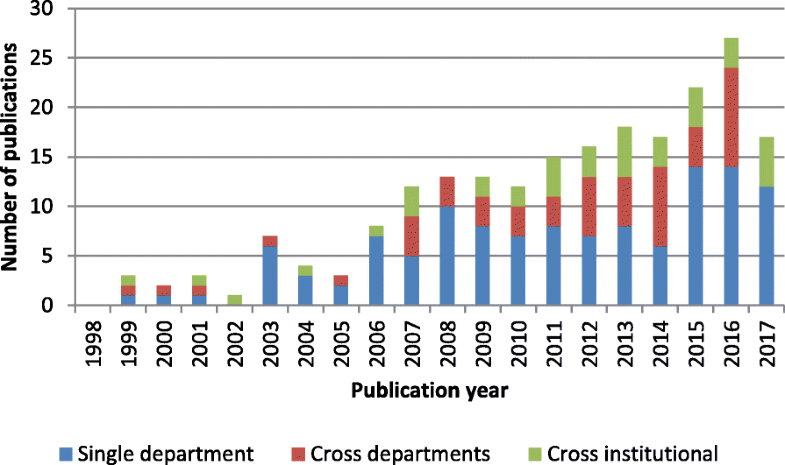 The presence of system dynamics is observed in all periods, although the number of publications remained small. 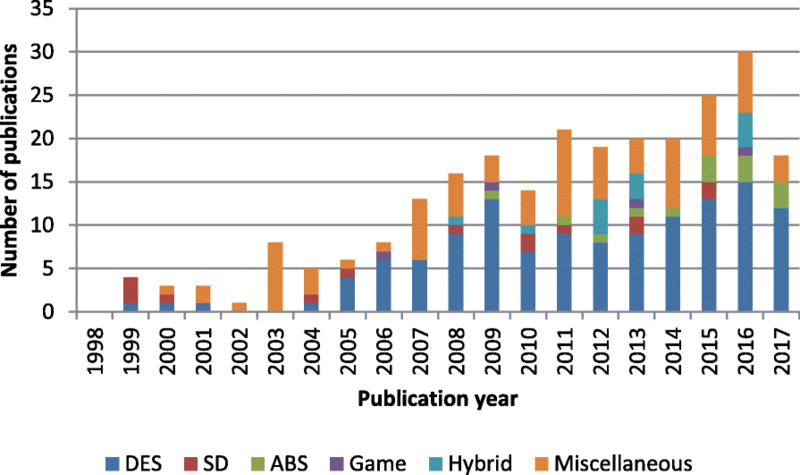 Agent-based simulation, games, and hybrid modeling were utilized only in the last decade. The specific simulation paradigm used was not stated in some studies, especially between 1998 and 2007, during which the majority of the methods used were classified as miscellaneous. Game-based methods were used in a few studies. Thus, interactive simulations are still quite new and rarely used. The single category was the predominant level addressed in all periods, as shown in Fig. 3. Between 2008 and 2012, the majority of studies addressed logistical issues at the single-unit level. The systems perspective was introduced between 2013 and 2017. Work addressing logistics issues at the cross-departmental and cross-institutional levels formed half of all research efforts. However, cross-institutional issues remained largely underexplored in the literature compared with other problems studied. Discrete-event simulation was the most prominent simulation paradigm in material-centric approaches as well, as shown in Fig. 4. The research theme started to develop in 2006, after which the number of publications and the diversity of the utilized paradigms increased. Despite the growth, six of 16 papers utilized discrete-event simulation, and only three papers utilized system dynamics, agent-based simulation, and/or hybrid modeling. Compared with patient-centric logistics, material-centric logistics was covered by a limited number of articles. Shah et al. had already stressed the underexplored potential of this area in 2004 . We identified few publications on this subject during this period. The period 2013–2017 showed the largest output, but the volume was still not able to catch up with that of papers related to patient-centric logistics. As shown in Fig. 5, a growing number of papers have analyzed material handling between multiple units. However, simulation design for cross- and single-department logistics was lacking over the last 5 years, despite studies reporting on the need for improving hospital internal supply chains to reduce costs . The literature review demonstrated that different simulation techniques could be utilized for different educational purposes, as summarized in Table 3. Discrete-event simulation is suitable for operational problems, whereas strategic issues are better explored by system dynamics. Agent-based simulation stands out as a versatile tool because that agent method is object-oriented and flexible for describing the anatomy of complex systems formed by multiple actors. Healthcare logistics is a complex socio-technical system characterized by interconnected components and non-rational operation management. Agent-based simulation can explicitly model the interaction between system components, facilitating the understanding of overall performance under uncertainty and dynamics. Games and participatory simulation are particularly useful for training at the tactical level because games help identify productive or counterproductive human actions. The strength of the agent-based method is the modeling and analysis of human behavior [33, 41]. Healthcare logistics are largely characterized by non-rational operative decision making by medical personnel regarding needs of their patients. By modeling decisions at the agent level, it is possible to obtain insight into the reasoning process of decisions being made . By involving these operational experts in participatory simulations, we can assess their perception of processes and healthcare system operations . This effort delivers insight at another level of abstraction than technical, often discrete-event-based, simulations can provide. Regarding training purposes, agent-based simulation and games are suitable for training negotiation and coordination in logistics, whereas discrete-event simulation and system dynamics can be utilized for reducing the uncertainty of decision-making processes by adding details to the model. Participatory simulation is valuable for validating various simulators that model complex systems. The advantage of participatory simulation corresponds to the delivery structure of the investigated system, as healthcare logistics is carried out by collaborative efforts in which different professionals, knowledge, and skills work together. Discrete-event simulation has the lowest requirement of technological preparation and is found to support all areas [26, 44–46]. System dynamics and agent-based simulation might require formal methods and mathematics pertaining to system design, such as differential equations , decision theories , and game-based approaches . Complex socio-technical systems, such as air traffic controls , routinely apply flow and logistical simulations. The studies examined in this review indicate a growing practice of implementing simulation in healthcare settings to create situations in which the non-technical skills of managers, coordinators, and decision makers can be trained and developed. Building on existing concepts from other industries , future applications might be hands-on training of teams using gaming and participatory simulation alongside empirical data to create situations for training tricky decision making, for strategic planning, and for exploring the effect of decisions on other parts of the system . Our review yielded many examples of applications in healthcare, indicating that the issues of training of strategic or operational coordination and decision making in healthcare can all be addressed by simulation. The orthogonal simulation techniques are discrete-event simulation, system dynamics, agent-based simulation, game, and participatory simulation. For patient-centric logistics, discrete-event simulation in single-department/unit scenarios is the most dominant form of simulation, the maturity of which takes the lead over other categories by a large margin. As a systems perspective was applied, discrete-event simulation became less popular and was compensated for by system dynamics or hybrid modeling. The literature review showed that tools for logistical simulations vary in this field, with tools such as AnyLogic, Arena, NetLogo, and board games implemented most frequently. This is an extensive study analyzing the growth in the use of simulation in healthcare settings. The number of miscellaneous simulations was significant, although discrete-event simulation, system dynamics, and agent-based simulation were well-established and well-standardized simulation techniques in many software packages. Most of the miscellaneous simulations were custom-made solutions. A focal point of these papers was implementing the modular design of protocols, revealing a lack of standards. Compared with processes in many other industries, healthcare processes are less standardized, and thus, composition of services varies. We believe that much effort could be saved by employing standardization in both healthcare processes and simulation formulism. In the domain of material-centric logistics, the focus is on inventory management and network distribution. A general lack of articles indicated limited research effort. One reason is that material-centric logistics is not an independent research stream yet—in many cases, the analysis of material-centric logistics is attached to a larger research project pertaining to physical distribution and logistical management. System dynamics, agent-based simulation, and hybrid modeling were underdeveloped for handling the complexity of social-technical systems. Digital transformation would change many aspects of the human-technology interaction in the provision of health services. A knowledge gap exists between the promise of future delivery of care that abolishes institutional boundaries and the current methods for testing and demonstrating functionalities. To bridge this gap, we require a better understanding of interconnected relationships between care providers and extensions to model individual-level requirements. The review has limitations. The search terms were formulated by the authors. As a result, the data search might not have been comprehensive. To eliminate the risk of omitting important contributions, the search terms combined keywords related to content and scientific methods, respectively. Second, although both journal and conference contributions were considered, the exclusion of abstracts and posters might lead to publication bias according to the Assessment of Multiple Systematic Reviews (AMSTAR) checklist for assessing the quality of systematic reviews. Because the aim of the review was to identify logistical simulations for training and education purposes, the exclusion is understandable for the short contributions that are not able to document the simulation models in a detailed manner. Therefore, publication bias is not prevalent in our literature review. The review only analyzed papers published since 1998. This approach was taken because the growth in the use of healthcare simulations started as Jun et al. surveyed the practical application of discrete-event simulation in healthcare , which was noted by Persson and Persson . Therefore, a synthesis of the literature after 1998 should not distort the analysis. The overview demonstrates that the simulation models available are mainly event-based, which is understandable. The strict regulations and rules associated with the medical field make process simulation particularly suited to handling issues in this area. These perceptions, together with the lack of literature on using agent-based simulation and participatory simulation, suggest a research direction involving the development of ontologies, architectures, and terminologies for their better acceptance in training and education of non-technical skills, with more problem-solving studies performed to demonstrate the corresponding benefits. It is worth noting that the growth of digitalized healthcare occurs in parallel with the demographic change into an aging society. Currently, digital transformation, provision of homecare, and de-institutionalization are transferring practical applications into the decentralized paradigm. This effort requires coordination between caregivers and stakeholders. Agent-based simulation and participatory simulation can support comprehensive engineering to achieve quality and safety improvements. Therefore, agent-based simulation and participatory simulation are promising approaches for better handling healthcare logistics given current societal trends. This work is supported by the Stockholm County Council, in the design of the study and collection, analysis, interpretation of data, and writing the manuscript. CZ, TG, and SM designed the study and located the articles from the databases. CZ and TG performed the screening process. 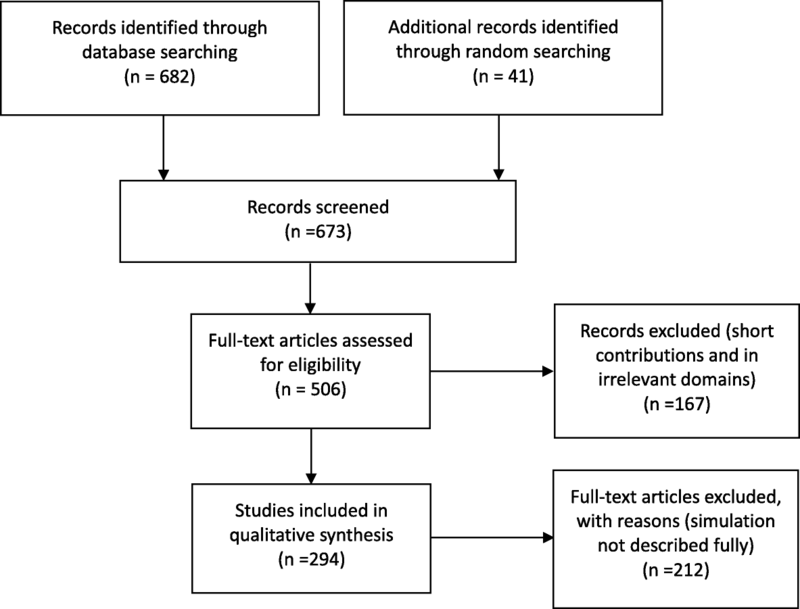 CZ, TG, SM, KH, and JH analyzed and interpreted the systematic review results. CZ and TG were responsible for writing the paper. KH, JH, and SM were the major contributors for revising the manuscript. All authors read and approved the final manuscript.